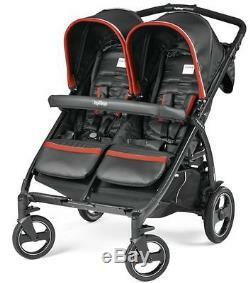 New Peg Perego Book For Two Compact Twin Baby Double Stroller Synergy. 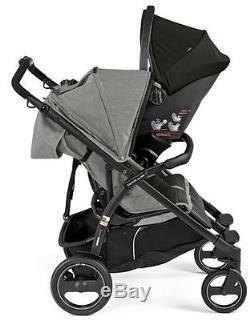 Our most compact side-by-side stroller, at just 29 wide. 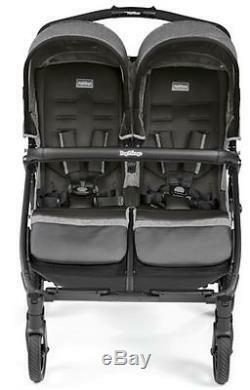 It can take up to two Primo Viaggio 4-35 car seats and folds easily and inward, like a book! 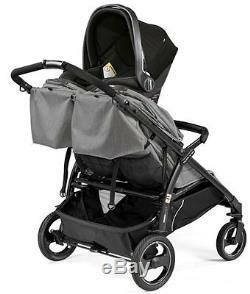 Travel System Compatible with up to two car seats (adapters Á car seats not included). Large, easy-loading basket with pockets. Soft Ride wheels with ball bearings and suspensions. From six months, up to 45 pounds (each child). Measuring at just 29 wide, the Book for Two is the side-by-side double stroller that will get you through those busy sidewalks or narrow store aisles with ease. 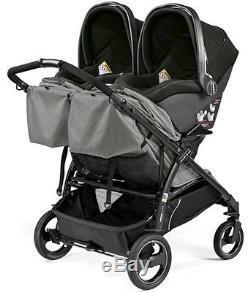 Not only is this double stroller compact, it comfortably sits two young children from birth, to 45 pounds. The independent adjustable backrests and footrests allows each child to travel at their own comfort level. Two Infant Car Seats (Not Included). One of the most unique features of the Book for Two is that it has the capability to hold up to two Primo Viaggio 4-35 car seats. 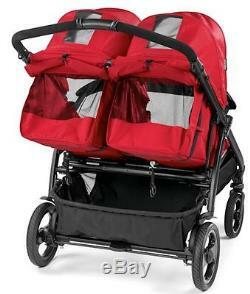 This allows parents to use the stroller as a travel system with twins from birth. The Book for Two transforms into a travel system with the use of adapters (not included). A single car seat is also available for parents with children of different ages. The Book for Two comes equipped with an extra-large basket that has three pocket dividers that are able to store smaller items, as well as netted storage pockets on the back of each seat. It has Soft Ride wheels with ball bearings and suspensions for a smooth ride on many different terrains. The large hoods of the Book for Two have peek-a-boo windows that magnetically open and close, as well as a mesh ventilation system to keep air flowing. 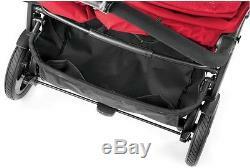 The front bumper can open to easily get children in and out of the stroller. Can fold inward like a book with just one hand. At just 29 wide, the Book for Two can easily fit through standard doorways. With adapters, the Book for Two can accept either one or two Primo Viaggio 4-35 car seats. 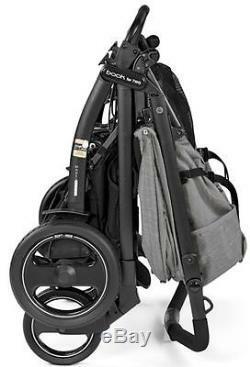 Innovative design allows for quick, easy and compact fold. 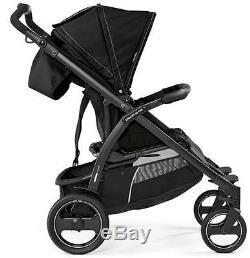 Polyurethane wheels with ball bearings and suspension allow for 360 degree agility, less effort in pushing and more comfort for baby. Very large, practical and easy-loading storage basket with smaller pockets included. Large, netted storage pockets included on the back of each seat. Both seats have a generous recline that can be implemented independently, allowing children their preferred comfort level. Each footrest reclines independently of the other. Allows for easy push with just one hand and can be modified to fit each parents height preferences. Front bumper bar hinges open for easy access to both children. Outfitted in Prima Classe material. Keep both babies protected with large hoods that include a mesh insert that provides extra ventilation and a magnetic peek-a-boo window. Upholstered with a variety of fashionable collections, in materials that will keep child comfortable. All Peg Perego baby products are Made in Italy. From concept, to creation, every step in the process is performed by Peg Perego and no one else. Dimensions Unfolded : 41.75" x 29.25" x 40.25. Dimensions Folded : 29.25" x 18.25". 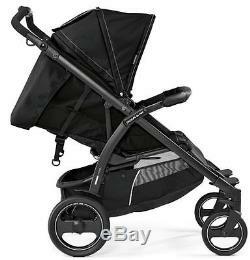 The item "Peg Perego Book For Two Compact Easy Fold Twin Baby Double Stroller Synergy NEW" is in sale since Friday, May 26, 2017. 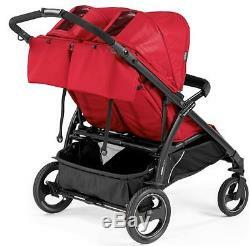 This item is in the category "Baby\Strollers & Accessories\Stroller Accessories\Other Stroller Accessories". The seller is "devinesuperstore" and is located in Whittier, California.